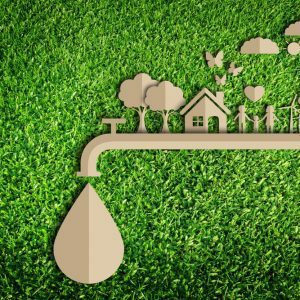 The Best Ways to Conserve Water in Kansas City | Turf Etc. Water usage all across the country is about to spike due to warmer temperatures, which is why it’s important to take steps to conserve water now. Conserving water isn’t only an environmentally-friendly habit, but it also saves you money in the long run. You can help prevent water pollution in lakes, rivers and the local water supply. One of the best ways Missouri homeowners can conserve water is by installing a synthetic lawn. Synthetic lawns don’t need frequent watering which eliminates most of the water used outdoors. Read the following tips to learn how you can start conserving water today! Lose the natural lawn and the water that comes with it. A 1,000 square foot lawn can use up to 300 gallons when watered with a just a half of an inch of water. That number can be even higher during the summer months when water evaporates quickly. Install artificial turf at your Kansas City home to eliminate almost all of that water use. Xeriscaping is becoming more popular because it not only saves money on your monthly water bill, but it also saves thousands of gallons of water every year. Artificial grass can beautifully replace your Missouri lawn and will also perfectly complement your living landscape features such as flowers, bushes and trees. You should choose native plants so they know how to survive in your environment. They’ll also be able to stay alive even with less water in the summer. If you’re unsure of the native plants in your area, you can talk to a professional at a local nursery, talk to the head of your HOA if you have one or view this online database. While artificial turf does promise low-maintenance, it doesn’t mean there is no maintenance involved. Synthetic lawns require a quick spray from a hose to stay clean and to quickly remove debris. We recommend keeping an eye on the weather to watch for rainfall which might mean less work for you. Let Mother Nature take the lead and watch as rainfall naturally clears debris away and waters your plants. Our synthetic lawn systems feature a drainage rate of 45-inches per hour and because you don’t need to use harmful chemicals to fertilize your lawn, your lawn’s run-off won’t pollute water supplies. If it doesn’t look like rain is in the future, brush the fibers with a stiff, non-metallic brush to fluff your lawn and clear away debris. One huge water waster comes from leaks in your home water system. These are typically hard to detect because they occur underground, where they are less likely to be noticed. Leaks can waste hundreds of gallons of water without your knowledge. The best way to check for a leak is to keep a close eye on your water bill and check that it matches how much water you’re actually using. If you see a huge spike in use, it may be time to call a plumber or landscaper for a closer evaluation of your waterlines. Conserving water during the summer months can help save you money on your monthly water bill. By following these tips, you can start living an eco-friendly lifestyle. For a free quote on the installation of synthetic grass at your home, contact us today!